Climate change represents the greatest health threat of this century. It is critical that the US public has an understanding of climate change and the opportunities for effective responses. A Presidential Task Force of State, Local and Tribal Leaders and the U.S. General Accounting Office (GAO) have explicitly recommended an expansion of health communications on climate change. Effective health communications is considered a core component of the public health toolbox, and communications is embedded in two of the Ten Essential Services of Public Health. Research has shown that health professionals are trusted messengers and best suited to relay health messages health. Some research suggests that framing climate change as a health issue engenders a more hopeful response and provides motivation for action. Yet few health professionals currently feel comfortable talking about climate change. 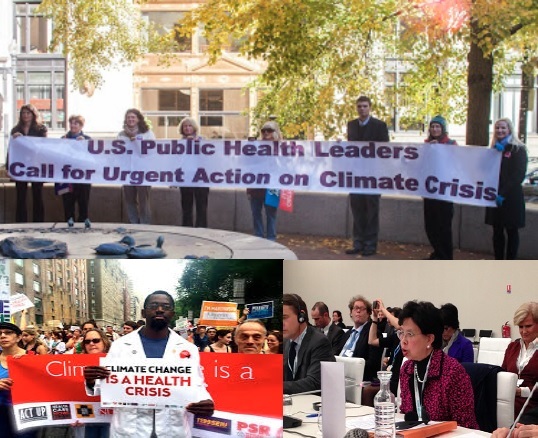 In an effort to address the need for further work on health and climate communications, the Center for Climate Change and Health (CCCH) held a workshop on October 6, 2015, in Oakland, California. We brought together 20 leading health and climate change communications experts for an initial dialogue that provided insight into further steps required to develop health-specific communications strategy and messages to more effectively leverage the health voice for action on climate change. In this report, we summarize our key takeaways, a summary of workshop presentations, an outline of key discussion themes, and CCCH recommendations for further research and action on climate change and health communications.